Your chance of winning is 0.0002%, but anyone interested in competing in a handicapping tournament, DRF Tournaments is hosting a free shot at a $10,000 paid entry, plus travel, to the 2016 Breeders Cup Betting Challenge (BCBC) at Santa Anita Park on November 4-5. As of ~noon ET there were about 500 spots remaining in a pick-and-pray tournament capped at 5,000 entries (one per person), so if you're interested enter here. For any NJ Horseplayer readers new to the handicapping concept theme, the premise of today's event is simple -- before 4:20 p.m. ET, select the winners of 7 races and cross your fingers. You will make mythical $2 win-place wagers on these races and attempt to build the highest bankroll by contest's end. Notional caps are 20-to-1 ($42) on the win end and 10-to-1 ($22) on place; so if the winning horse pays $100 to win and $50 to place at the track, best you can do for contest purposes is the $64 maximum score. The prospect of beating 4,999 other players are meager, but at the very least one you can take advantage of free DRF past performances to break down races 7-10 from Saratoga and 1-3 at Del Mar in the hopes of accruing the largest bankroll by contest's end to lock in a sweet prize. It seems that DRF Tournaments also added $50 consolation prizes (in account credit) for the second through twenty-first place finishers. 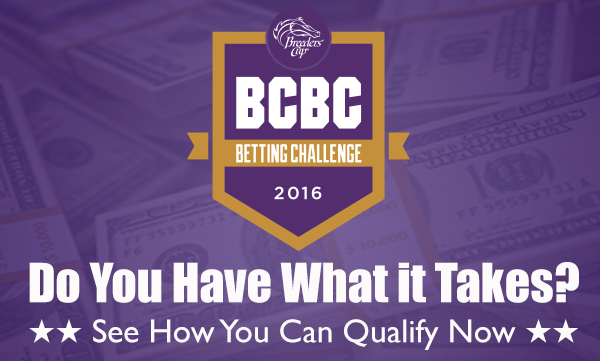 The BCBC is a live-bankroll tournament where players compete for an estimated $1 million prize pool. The National Handicapping Championship (NHC) Tour, of which I am a member, gets more notoriety for its $2.5 million year-end tournament in Las Vegas, but the BCBC is hosted on what is North America's greatest racing weekend. The races generally are tremendous and opportunities to score major winnings are abundant. It's worthwhile at least taking a shot at today's free tourney. If you do enter, the DRF Tournaments website is improving, but there are still a few aspects of the contest interface that lag others on the market. You need to pick your top choice ("select primary pick") and alternate in case your primary is scratched from the race ("select alternate pick"), but be aware that your top choice will be negated if your backup selection is scratched and you will need to re-enter your top choice (and a new secondary selection, of course) manually. That's exactly what happened to me this morning when my backup scratched from Race 8 at Saratoga, which is a significant quirk. Had I not been paying attention, my top selection (12-to-1 Baby Bear's Soup) would have defaulted to a post-time favorite that I do not think will win. This does not happen on other online contest sites; so regular players used to HorseTourneys.com or Horseplayersqualify.com need to be cautious in this regard. Also, if unlike me you are not on the beach and you want to keep a live track of the leaderboard, in the few NHC-focused contests I have entered, updates tend to be clunky. Prepare for slower response times than on rival sites. It is easier just to check back at contest's end to avoid any frustration. Otherwise, I appreciate the fact that the BCBC operators sponsored today's contest, where I am winging it a bit with the following selections. Good luck to all who enter! Saratoga 7, #6, Skylar's Pass (12-to-1): A first-time starter like most of the others entered but with some snappy works and out of The Factor, who I remember as a precocious sprinter. Del Mar 1, #7, Tiz Jolie (6-to-1): Prefer the rider switch to one known to like the front end in a bottom-level race where the leader could wire the field. Saratoga 8, #2, Baby Bear's Soup (12-to-1): Front-end type who seems to like one-turn races and dominated lesser last out but who ran against tougher in his first four lifetime races. Del Mar 2, #6, Look Twice (7-to-2): Similar thesis to Baby Bear's Soup. Saratoga 9, #12, Sugar Mags (15-to-1): Several prior races fit with today's field and sense Joel Rosario can get a clean trip and close into a quick pace, akin to my score on Saturday with 14-to-1 Irish Prayer in the Saratoga finale. Del Mar 3, #4, Friulian (10-to-1): Scratched from a deeper and tougher $80k optional claimer on Saturday for a softer spot here against only six others at the $62k allowance condition. Saratoga 10, #7, Means Well (15-to-1): Colts Neck Stables is in walking distance to my house and I rarely like their horses when shipped to Saratoga, but the morning line is ludicrous for a horse who, although trying a turf sprint for the first time in 19 starts, I think will appreciate a distance cutback and a field rife with front-end speed that can melt down late; look for a late charge here to the wire to secure my $10,000 BCBC prize.